The Dead Files is a paranormal show created by the Travel Channel. It focuses on investigating haunted locations across the United States. There are several factors that make The Dead Files an interesting show to start watching. The investigators bring unique skills to the show. Steve DiSchiavi is a homicide detective who retired from the New York City Police Department after working with them for more than 21 years. Amy Allan is a physical medium who specializes in communicating with the dead. Steve uses the experiences he had and the skills he learned while he was on the NYPD so he can interview people, search each haunted property, and conduct other research. Amy uses her ability to communicate with the dead in order to find out similar information. The Dead Files also has a unique kind of investigation. There isn't an entire group of people moving from room to room asking unseen entities questions, for example. They also don't arrive together, nor do they sit alone in different rooms. During an investigation on The Dead Files, the investigators don't work together; instead, they work separately. Their individual findings are also kept secret from each other. This is done to make sure one investigator's findings don't affect the other investigator's findings. Each episode alternates between each investigator's separate search. An episode begins with Amy walking through the haunted location. She uses this time to contact any spirits haunting the location; however, before she does this, her husband and assistant, Matt, removes any items that could affect her communication. This includes personal items, such as photos. Her walkthrough is intercut with scenes of Steve's investigation. He's shown researching the location's history and interviewing anyone who has witnessed the paranormal phenomena. This includes the current owner or owners, any previous owners, and any other witnesses. Sometimes, Amy works with a sketch artist to find out what the spirits or other paranormal entities look like. At the end of each episode, they meet with the property owner or owners. During this meeting, they discuss what they learned during each investigation. The Dead Files is an interesting show to start watching. The investigators, Steve DiSchiavi and Amy Allan, do a good job at combining their differing backgrounds and skills to find out what's really going on in each case. How the investigations are done and the structure of the episodes also make this show different. Steve and Amy travel to Kentucky investigate a woman's claims that something in her house is attacking her kids and changing her husband's personality. During her walk, Amy discovers a dead cowboy who can cause the living to die of sudden illnesses. Steve and Amy help an Ohio man who believes something on his property is attacking his mother. Amy discovers the land is suffering under a curse that hinders the lives of the living and encounters a bitter dead man using the curse to his advantage. Steve and Amy travel to Nebraska to help a woman who believes paranormal activity has taken control of her husband. During her walk, Amy encounters a mischievous trickster whose pranks are becoming more and more vicious. An enhanced episode: Steve and Amy investigate claims of hateful paranormal activity in a family home in North Haven, Conn. Steve delves into the cruel past of a ruthless businesswoman, as well as one of the most savage homicides in North Haven history. Meanwhile, Amy discovers a dangerous psychokinetic manifestation and an evil female entity with two malicious henchmen. Steve and Amy travel to Pinellas Park, FL, to investigate a mom's claims that ever since her son moved in, paranormal activity has gotten violent and out of control. During his investigation, Steve learns about two deaths associated with the house, and Amy fears a living person that dabbled in witchcraft lured dark entities to the home to curse the family. Steve and Amy travel to Ohio to help a terrified couple save their business, son and marriage from violent paranormal activity. During her unsettling walk, Amy discovers two groups of warring dead people who torment each other and the living. Steve and Amy investigate unusual activity tormenting a husband-and-wife team of paranormal investigators. During her unsettling late-night walk, Amy encounters the spirit of a malicious dead woman set on taking the life of the innocent. Steve and Amy investigate violent paranormal activity terrorizing a vulnerable mother and her young child. During her late night walk, Amy encounters several entities, including a dead man who is hell-bent on possessing and tormenting the living. In an enhanced episode, Steve and Amy investigate distressing paranormal activity at a home in East Flat Rock, N.C. During their investigation, Steve uncovers several deaths associated with the property, including a grisly, ritualistic murder, while Amy crosses paths with several dangerous entities. Steve and Amy investigate vicious supernatural activity tormenting a mother and her two daughters. During her late night walk, Amy encounters a menacing dead woman who physically assaults the living and an insidious vine-like entity. Steve and Amy investigate claims that a family of six is being destroyed by paranormal activity. During her walk, Amy encounters a group of demonic entities capable of possessing the living. Steve and Amy investigate claims that a family of six is being destroyed by paranormal activity. During her walk, Amy encounters a woman hellbent on attacking everyone in the house and a group of demonic entities capable of possessing the living. Steve and Amy travel to Grant Township, MI, where a desperate couple claims paranormal activity is trying to kill them. During the disturbing investigation, Amy encounters a malicious dead man and an entity capable of physically harming the living. Steve and Amy investigate an abandoned amusement park in Lake Shawnee, WV. A terrified woman calls on Steve and Amy to investigate claims of vicious paranormal activity at her Berthoud, CO, home. During her after-hours walk on the property, Amy encounters a demon set on tormenting the living and a malevolent shadow person. Steve and Amy travel to a home in Murrieta, CA, where a mother worries that her husband's dealings in witchcraft have led to the paranormal activity that's tearing her family apart. Steve and Amy travel to Briceville, TN, where a single mother fears for the safety of her children and the sanctity of her home as vengeful spirits torment them. During her late-night walk, Amy discovers a vindictive spirit with a hatred for kids. Steve and Amy travel to Kentucky to investigate paranormal activity terrorizing a mother and her two children; and Amy's late-night walk leads her to an interdimensional portal filled with malicious aliens set on tormenting the living. Steve and Amy investigate investigate paranormal activity terrorizing an elderly Arizona couple. While Steve's investigation reveals the property's bloody history, Amy uncovers an entity hellbent on trapping the souls of the living. Steve and Amy investigate paranormal activity at a historic hotel where the dead take pleasure in tormenting both employees and guests. During the daunting investigation, Amy confronts a dark presence vying for control of her physical being. Steve and Amy investigate paranormal activity harassing a young couple and their children in El Cajon, California. While Steve discovers the unsettling details of an infamous serial killer in the area, Amy goes toe-to-toe with a vengeful spirit. Steve and Amy investigate paranormal activity harassing a young family in Flint, MI. During her late-night walk on the property, Amy encounters a sinister old man and confronts a tar-based entity that preys on the vulnerable. The Dead Files is currently available to watch free on Travel Channel and stream on Travel Channel. 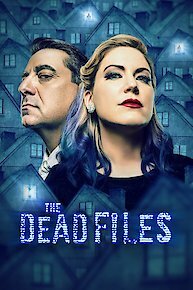 You can also stream, download, buy, rent The Dead Files on demand at Philo, Amazon, Hulu, Vudu, FandangoNow, Google Play, DIRECTV NOW, iTunes online.